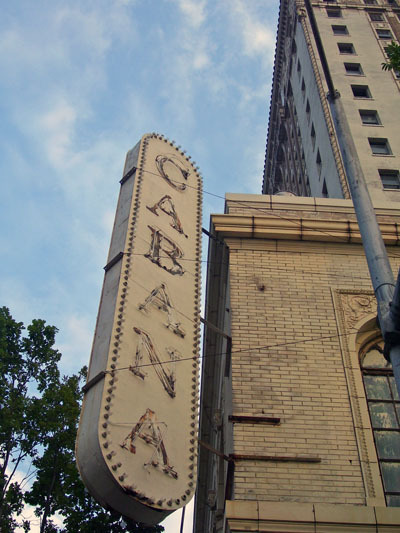 The Cabana Hotel, formerly the Hotel Jefferson, was once one of the jewels of the Birmingham skyline. The building sits in the Fountain Heights neighborhood on a city block situated between 1st & 2nd Avenues North and 16th & 17th Streets North. This week the building will be going before the City of Birmingham’s Design Review Committee for approval of new signage. This will hopefully be the first step taken in plans to renovate the building. Leer Corporation’s plans call for the building to be converted into condominiums and renamed Leer Tower. The proposed elevations for the completed project can be seen on their website by clicking here. The building would be the latest conversion of space in Fountain Heights, home to Jemison Flats, the Phoenix Building Lofts, the Innovation Depot (a former Sears store; Innovation Depot Breaks New Ground for Birmingham Biotech, Birmingham Medical News) and countless others. The image is of one of the signs that will be permanently removed as part of the renovations. It is currently located on the northeast corner of the building facing the Phoenix Lofts. Click here to see links to the series posted so far. Click here to view the photo gallery. We’ll let you know what happens at the meeting later on this week. P.S. Don’t forget to subscribe to the Ramblings, you can either click on the orange box at the top left of the page or e-mail subscription links to your left. I do not know for sure; I do not wish to assume anything. They could always be getting approvals to move the process forward after a decision is reached, but I suppose we'll find out soon. So Leer is pursuing design review approval... did they settle the dispute with the company that claimed to have an option on the property? I love the new header image! Also, I found another neon sign for you--Taj India on Highland has a beautiful little blue squiggle. So simple, so evocative.